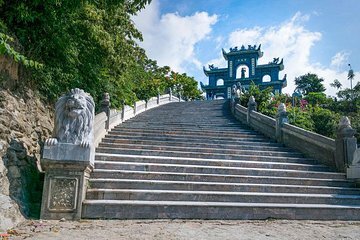 Photographes et Instagramers ne voudront pas manquer cette visite guidée de porte à porte qui offre les meilleures vues des montagnes escarpées autour de Da Nang. En 4x4, visitez un village de pêcheurs pittoresque, le col Hai Van, Thuy Son dans les montagnes de marbre, la montagne Son Tra (montagne des singes) avec son hélipad de la guerre et la pagode Linh Ung avec sa statue imposante. En chemin, dégustez un pique-nique et un café vietnamien. Got picked up in the US army jeep, a good way to travel in the heat. Got taken to the Marble mountain Buddhist Pagoda first up, an amazing place to go as some of it was in the mountain in caves, quite a few steps here, quite hot, lucky had a fan. Then off for a drive up to the Hai Van pass great scenery on the way and at the top. 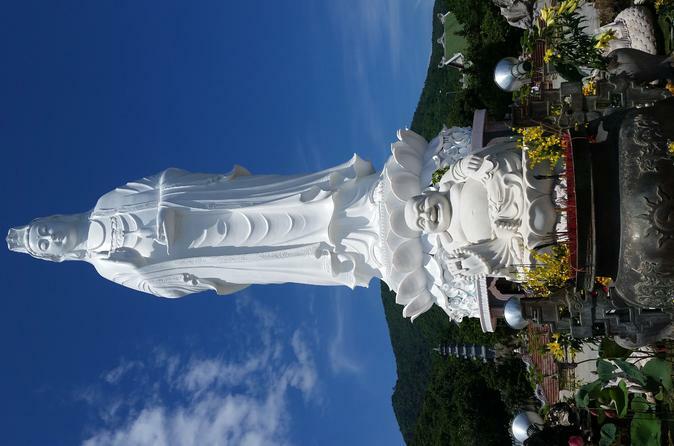 Then back down, then to go up Monkey Mountain where the radar things were used during the war by the US but now by the Vietnamese, didn't see many monkeys but on the way back down stopped into the lady Buddha pagoda built only a few years ago, this was very nice and a huge complex. The views from here were great. Then taken for lunch at this restaurant, lovely meal, lots of small dishes, we both enjoyed it sitting looking out onto the beach, beautiful sands here. Then back to our hotel, a good day out and a different mode of transport, the jeep still goes well.